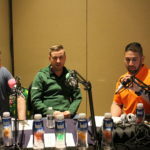 Portland Timbers Head Athletic Trainer Jon MacGregor joins the Sports Medicine Broadcast to discuss functional hamstring progression in soccer athletes. Jon was named Portland Timber first team's head athletic trainer after spending the past three seasons (2015-2017) with Columbus Crew SC. MacGregor, a certified and licensed ATC with a bachelor’s degree in athletic training and a master’s degree in sports management, spent the 2017 season as the head athletic trainer for Crew SC after spending the previous two years as the assistant athletic trainer. Prior to joining Columbus, MacGregor spent four-and-a-half years with Vancouver Whitecaps FC, serving as a first-team athletic trainer and as the head athletic trainer for the club’s residency program. What is PSATS to YOU? A great way to build community. We are on the same journey and are able to understand the situations. Want to earn some CEUs? This entry was posted in Orlistat non prescription, Workshop and tagged #PSATS2019, Aspetar, Functional, John, MacGregor, Matt Weston, MLS, Portland, Portland Timbers, Professional Soccer, PSATS on March 15, 2019 by Host of The SMB.